Print operates using Ctrl+P. What gets printed is essentially what you see is what you get. So, if you are looking at a rulebook and the Table of Contents is open and visible on your screen, then the Table of Contents will display when you print. If the Table of Contents is closed and invisible, then it will not display when you print. If "Related News" or another sidebar reference is open on the right sidebar, then those news items will display at the bottom of the page when you print. As an example, let's look at Exchange Act Rule 15c3-3. The advantage of using Cabinet bookmarks (as opposed to bookmarking from your browser) is that your bookmarks will be available from any device from which you log into the site. In addition, it will allow you to keep separate your Cabinet bookmarks from other browser bookmarks. Click the Unbookmark icon to remove the page from your bookmarks. 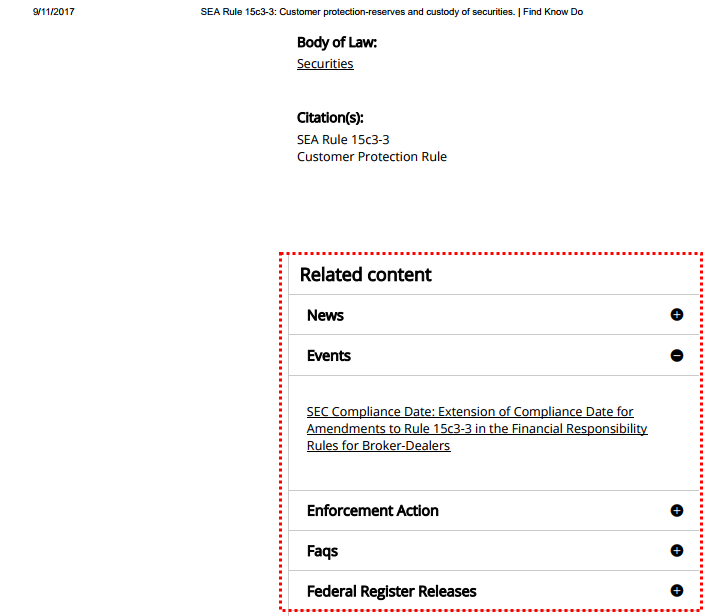 FindKnowDo tracks important regulatory event dates for several federal agencies and private SROs. You can view them at any time in the Events tab. Many people, however, will prefer to import FindKnowDo regulatory event dates into their own calendar, e.g. Microsoft Outlook. The advantage to doing so is that your FindKnowDo subscription entitles you to real-time updates, also known as “feeds”, as we publish them. Powerful calendaring apps such as Outlook will automatically pull down these updates within a refresh window, typically a couple of hours, keeping you instantly abreast of changes as the FindKnowDo professionals publish them. Subscribers and free users can find a detailed set of instructions here. By default, search results are sorted by "relevancy." This setting can be changed to "date" or "title" by clicking on the relevant link at the top left of the advanced search page. Relevancy sorts search results based on how often a search term appears in a document and how rare the term is in the entire document collection. If a user searches for a combination of terms (phrase), additional preference is given to documents that contain the closest version of that combination/phrase. Date gives results in chronological order, from newest to oldest (or oldest to newest if you click Date twice). Title puts the results in alphabetical order. A search on a particular word will generally include any common variants of the word, as well as plural forms. 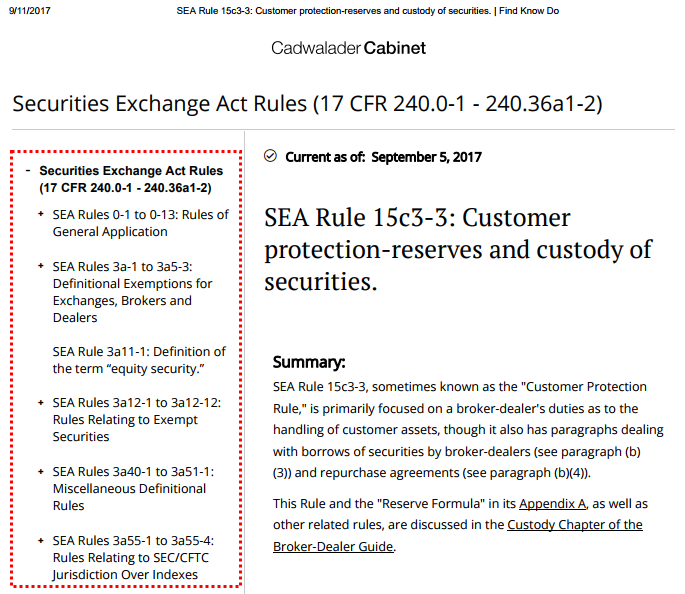 Thus a search on the letters "secur" will provide results that include the words "secure", "security" and "securities". and/or. Search in the Cabinet treats a list of words as all required to be in the relevant document. Thus, the search options futures will turn up a document only if it includes both the word options and the word futures. You may also search on option and futures to obtain that result. If you are looking for documents that use either of those words, but not necessarily both, connect the terms with or. Thus, a search on option or futures will return documents that use either term, or both terms. not. To exclude a word, you may use the term not. For example, if you want to search on "options", but only options treated as securities, you might use the search: options not futures. If you are looking for an exact phrase, you should surround the search terms with quotes. For example, a search on "security futures" will turn up documents with that exact term, but not documents that use both terms but do not use them in combination. Parentheses around terms can be used to create more exact search instructions, or combine multiple queries with different operators or to perform nested queries. For example, (swap or futures) and equity will return documents that have (i) either the word swap or the word futures and (ii) that also have the word equity. Where you want to search for terms that you expect to be close together, you may put the relevant words in quotes and RIGHT NEXT to the quotes, add a tilde (which looks like this:~) and a number (which indicates the degree of permissible separation between the words. Note that there should be no space after the closing quote or after the tilde. For example: as search on: "transactions commerce"~3 will return results that include "transactions in interstate commerce. Similarly, a search on: "liability agent"~7 will return results that include "liability of the principal for an agent". If you wish to search only on the words in the title of a document, use the formulation label:word ("label" should be all lowercase letters followed by colon, ":", without space). For example, a search on label:confirmation will give you results with the word "confirmation" in the title of the document. Exact phrase search can also be used in the title only search. For example, a search label:"confirmation letter" will give you results with the phrase "confirmation letter" in the title of the document. Wildcard Searches Using * or ? The symbols * and ? are wildcards that can be used for either (i) many letters in the case of the * or (ii) a single letter in the case of the ? The * wildcard can also be used if you want to find all words that begin with the same letters. For example, a search oncCommo* will turn results that include both the word "commodity" and the word "common". Beginnings and endings. Putting * in the middle of a word will return all words that have the specified beginning and ending. For example,: a*k will provide search results that include the words ask, attack and asset-back. Note: wildcard searches don't work in phrases. For example, you will get different results, as a result of this boost if you search: lending^10 and repurchase as opposed to lending and repurchase^10. Same number of results but in a different order. 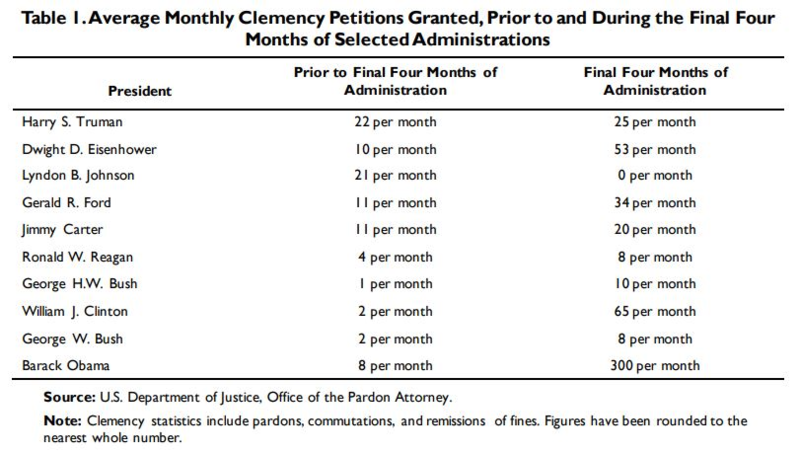 Cabinet Compilations is a list, primarily by agency, of the public laws, Federal Register releases, no-action letters, interpretations, and other compilations of materials currently included on the Cabinet. A separate list of statutes and rules on the Cabinet is also available.